A tobacco pipe with Irish markings currently on display at display at Immaculata University Library exhibit about the Duffy’s Cut victims, 57 Irish railway workers that were victims of cholera and violence. The quest to uncover the truth about the deaths of 57 Irish railroad workers on the Main Line in 1832 has led to an encouraging discovery: Ground-penetrating radar last month found several anomalies that suggest more bodies remain buried at Duffy's Cut, a patch of woods between an Amtrak line and a manicured Chester County cul-de-sac. The young immigrants arrived in the United States from Derry to work on a stretch of rail on the old Philadelphia & Columbia line, about 30 miles from Center City in Malvern. Within several months, all of the workers were dead. Official reports at the time listed the cause of death as cholera. For decades, the circumstances of their deaths have drawn the curiosity of the Irish American community, which suspected foul play. Dr. William Watson, Professor of History at Immaculata University, left, and Rev. Dr. Frank Watson, right, led the effort at Duffy’s Cut archaeological dig site, to investigate the mystery of the Irish rail workers, they are shown here at the site where they found bodies of the Irish rail workers who were victims of cholera and violence, Wednesday, July 12, 2017, in Malvern, Pennsylvania. In 2002, twin brothers William and Frank Watson discovered documents kept by their late grandfather, who had been the executive assistant to the president of the Pennsylvania Railroad. The file came with instructions that the information be kept private. The documents contradicted the story released during the cholera epidemic. They revealed that instead of eight deaths, 57 people had lost their lives. But untreated cholera has a mortality rate of only 50 percent. Something didn't add up. Why did everyone die? The Watsons embarked on 15 years of research. The burial site happened to be just minutes from Immaculata University, where William Watson is a history professor. Excavations between 2009 and 2012 unearthed the remains of six men and one woman, who was a cook and laundress. Forensic examiners determined the seven had died violently, by bullets and blows from sharp implements like axes. William Watson said he believes a vigilante group murdered the immigrants out of a fear of cholera and prejudice against the Irish, who were often blamed for the epidemic. The Philadelphia & Columbia Railroad then covered up a massacre. "What happened at Duffy's Cut is kind of an epitome of the fear of cholera, of the fear of the foreigner," said the Rev. Frank Watson, president of the Lutheran Archive Center in Mount Airy. "It certainly speaks to some of the worries and concerns people have today and the craziness that we see perpetrated in different communities around the world." Forensic scientists identified two of the bodies, which were given proper burials in their hometowns in Ireland. In 2012, the five others were buried in West Laurel Hill Cemetery. 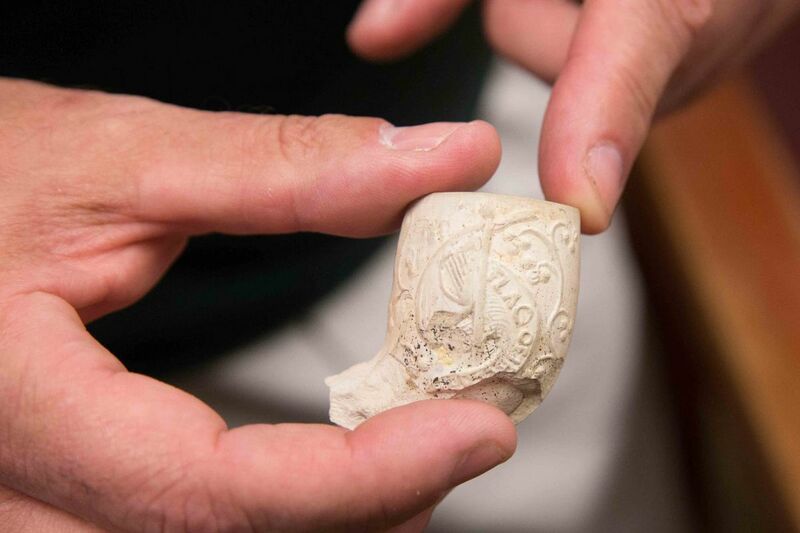 Other discoveries of artifacts included a pipe stem with the word Derry imprinted, now requested by the Maritime Museum there, and a clay pipe bowl with an Erin Go Bragh flag on it, which William Watson believes is one of the oldest examples of Irish nationalism in the United States. Recovery of more bodies halted for several years due to cost constraints and safety considerations given the proximity to the Amtrak line. This summer, radar surveys identified anomalies in the ground that suggest seven more bodies, as well as one large presence underneath a 1909 stone monument, which the Watsons suspect could signify a mass grave. If more foul play is confirmed, William Watson believes Duffy's Cut could be the site of the worst mass murder in Pennsylvania history. A photo of a photograph of the remains of Catherine Brown. This photo is on display at a museum about Duffy's Cut at Immaculata University Library. The researchers hope to give any bodies burials that respect religious tradition. The brothers said they now have full support of Amtrak. Railway workers of Irish descent have volunteered to help excavate the site. "We went out there and it just kind of got in our blood," said Pearse Kerr, an Amtrak worker and representative of the International Brotherhood of Electrical Workers. "It's something that pulls on your heartstrings. As Irish railroaders, it's a perfect fit for us. This is our predecessors." The story has taken on a life of its own, spurring international attention as well as documentaries, books, albums, and an opera. A new documentary, The Cut: The Journey of the Men and Women of Duffy's Cut, is aimed for a summer television release. "The connections of loss and grief and covering up of stories transcend boundaries, transcend religions and denominational differences in a very powerful way, " Frank Watson said. Immaculata offers a scholarship for students to travel to Ireland in recognition of Duffy's Cut. Last year the school held a two-week training program for teachers to incorporate the event into history lessons, funded by a grant from the National Endowment for the Humanities. Investigators plan to take core samples around the seven anomalies within the next few weeks to look for evidence of decomposition and hope to start excavating by August. US Radar surveyor Harold King estimates a 70 percent chance that the anomalies lead to seven more remains. "We kind of were in something of a limbo," Frank Watson said. "We wanted to finish it. We knew that this was a story that had grabbed a hold of our souls. We've continued with the hope that we actually will be able to finish this out. Our philosophy is, leave no man or woman behind."